Migrate AOL to Office 365 with & without Impersonation. The AOL PFC Converter provides advanced setting options to set the output PDF file according to Margin (Top, Left, Bottom, Right), Paper Orientation in Landscape or Portrait, Page size (A3, A4, Letter), Bates Numbering & Stamping by Position. AOL PFC Converter tool migrates PFC file emails created by the AOL Desktop versions such as AOL Desktop 10.0, AOL Desktop 9.0, AOL Desktop 8.0, AOL Desktop 7.0, AOL Desktop 6.0, etc. The AOL PFC Converter is compatible with Windows versions namely Windows 10, Windows 8.1, Windows 8, Windows 7, Windows Vista, Windows XP, etc. 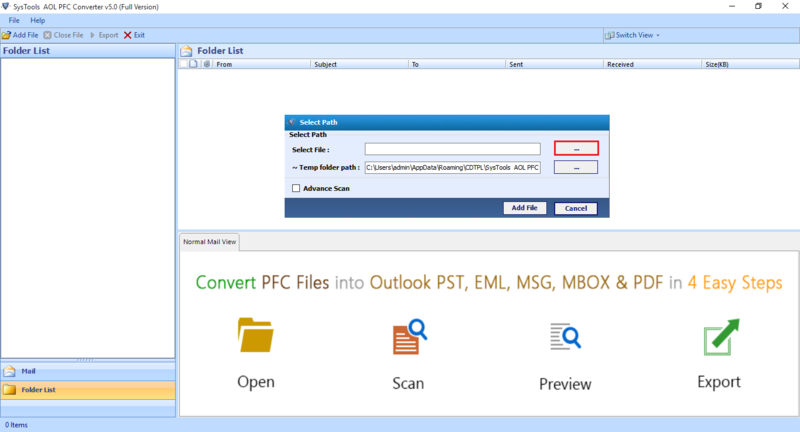 to convert AOL PFC file to Outlook PST, MBOX, PDF, MSG, EML and Office 365. 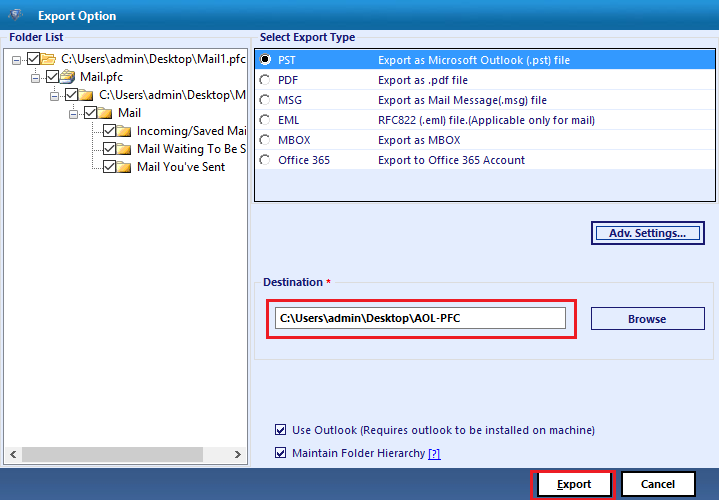 You can export AOL to Outlook PST file. There is an option to use Outlook for the conversion process. In this feature Outlook is Optional for the PFC to PST Conversion process. The tool provides Split PST option to divide large PST to small according to the size specified by the user. This AOL PFC Converter Tool allows users to forward AOL email to office 365 Account. During the export procedure, users are provided with two options: With & without Impersonation which will allow to move data to multiple mailboxes within Office 365 Account. By exporting your PFC file into EML format, you will be able to access the mails in multiple email clients due to its extensive usage. Naming convention option & Maintain folder hierarchy options are added with this file type. You can export AOL PFC files into MBOX and thus access in different clients; Thunderbird, Mozilla, Netscape, Google Takeout files, etc. While converting the PFC to MBOX file, you will get options to filter emails according to date. The AOL PFC Files converter software supports batch PFC files to export. You can add all your PFC files one by one in the software interface. The tool then offers you to export them individually or in bulk. You can print your AOL PFC email because the tool provide the option to convert PFC to PDF. Advance PDF setting option helps to set the output PDF file according to Margin (Top, Left, Bottom, Right), Paper Orientation in Landscape or Portrait, Page size (A3, A4, Letter), Bates Numbering & Stamping by Position. A selective export feature is provided to you for easing the selection process so that You can also convert only relevant PFC files. For this, simply select those PFC files which you want to export, from the export pane. You can add multiple PFC files by selecting or deselecting the PFC folder directly from the export pane of the tool and then export it into PST, EML, MBOX and MSG file types. You can rename your PFC file emails while exporting them into EML, MSG & PDF. The software offers you naming convention so that you don’t have to re-think when sharing/ searching that particular email. These are the multiple file naming conventions by AOL PFC converter: - Save as Subject, DD-MM-YY, DD-MM-YYY, YYYY-MM-DD + subject, MM-DD-YY, MDS, Auto Incremental, etc. SysTools AOL PFC File converter is a Windows based software where there is no compatibility issue with the platform it uses. From the latest version, Windows 10 to all other below versions of Windows OS are successfully supported by AOL PFC converter. Before converting your PFC file, you can filter them according to the selected date range, so that only the required mails get exported from the PFC file. If you are using Window 10,8.1/8/7 or Vista, then please launch the tool as "Run as Administrator". AOL Desktop: AOL Desktop 10.0, 9.0, 8.0, 7.0, 6.0, etc. What all are the features of SysTools AOL PFC Converter that makes it unique among the other similar utilities available on the market? "I heard about your product from my colleagues. I would like to know some of the characteristic features of this tool so that I could choose it from others." The AOL PFC Converter is compatible with Windows versions namely Windows 10, Windows 8.1, Windows 8, Windows 7, Windows Vista, Windows XP, etc. to transfer AOL email folders to Outlook. 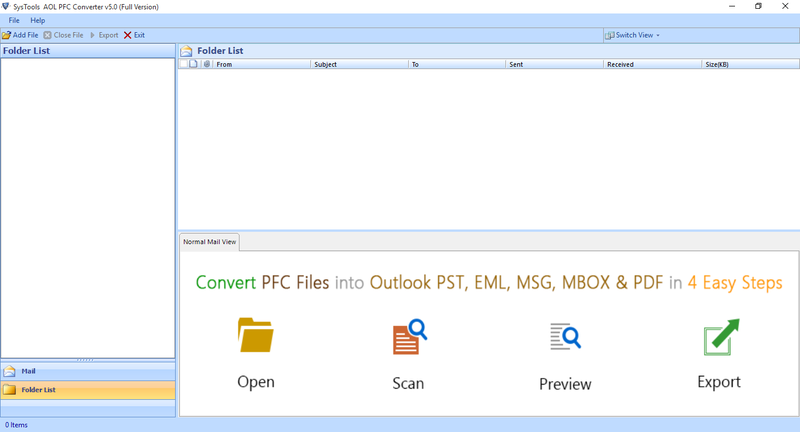 Do I need MS Outlook installed on my PC to convert PFC to PST using your tool? It is optional to have MS Outlook installed and configured on your machine to convert AOL PFC file to Outlook PST. Can I forward AOL email to Office 365? Yes, you can easily migrate AOL mail to Office 365. The software is designed in such a manner that it will export all your data from PFC files to Office 365 without any data loss and modification to the original data. Is it possible to convert AOL PFC file to html using your converter software? No, currently we provide the provision to convert PFC to MBOX, PDF, MSG, EML, and PST file formats. But if you have such a requirement, it could be added as a custom requirement. For this you need to email us on our support email address or you can also contact our live chat support team. Can I export my whole PFC data at once? Yes, you can export AOL PFC files one by one in the software interface and later use the selective export feature to export each PFC file individually or in bulk. Is it possible to convert PFC without having AOL Desktop Software installation? How to convert bulk contents of PFC to PST without getting it corrupted? You can filter the email data using Date filter option & create a chunk of multiple PST files split to avoid size related issues. The output is generated in a Unicode type PST. Yet you can filter specific folder during the export process and thus create smaller parts to reduce size related issues. How to select PFC files saved at different location on the machine? If you don't want to load an entire folder containing PFC files at once, try loading each file one by one and export the selective PFC only. Is it possible to import AOL PFC to Gmail with the help of your tool? Yes, To transfer AOL Personal Filing Cabinet to Gmail, first you need to use our AOL PFC Converter to convert your PFC to PST files. And then install GAMMO tool to easily import converted PST files into online Gmail Account. I wanted to transfer my AOL PFC to Outlook & was searching for a tool that could import my PFC to Outlook & make it available even after migration. I surfed the web a lot and finally found this utility. It helped me to convert all my valuable PFC to PST and I have completely migrated from AOL. Thank You SysTools AOL PFC Converter. It takes a lot of time in switching every single mail file between different email platforms as I have tried doing so from one of my email client. However, now I have found the cure. SysTools AOL PFC File converter converted my PFC files & saved my time. Now all my issues related to using different email clients are resolved. Being a technical expert, I was in an embarrassing situation in which I couldn't convert AOL PFC file to Outlook. I was hopeless to find an effective tool which could do it. Quite fortunately, I came to know about AOL PFC Converter. I used it and realized that it can convert AOL PFC to PDF, PST, EML, MSG as well as MBOX file format. I was committed to a project for which it was necessary for me to take the printout of my emails from my AOL account. I used your tool to convert AOL PFC to PDF and then took the printout of the resultant PDF files. Thanks to SysTools for helping me to complete my project.